Home Tags Posts tagged with "pike"
I drew a lot of inspiration from the flag of Liberland. The water, representing the Danube, became the fish, and I’m assuming pike or a close relative can be fished in the area. The mysterious fruit tree on the flag sets the tone for a uniquely Liberlandian ajvar, which contains apples and red plums and echoes the yellow color of the background (partly thanks to saffron). You can even think of the grill grill marks on the food as the black stripe on the flag! Both the ajvar and the flatbread (called lepinja) are popular throughout the region. All the ingredients, I believe, can be found locally. If you can’t buy and don’t want to make lepinja, you can use pita instead. Preparing most of the dish on a grill makes up for the lack of kitchen equipment or electricity. The whole recipe is also pretty quick and easy. True, the ajvar isn’t made on the grill, but a) it could be (just put your pan on the grate! ), and b) it can be made in advance. So this is it, the first Liberlandian dish! Next time, maybe we can shoot that bird on the flag and make a stew! Wrap the eggplant in foil, and bake in a 225 C / 450 F oven for about 45 minutes, until soft inside. Let cool for 10 minutes. Peel off the skin, cut in half, and let cool another 10 minutes. Weigh 150 g of eggplant flesh, cut into small dice, and reserve. Brush the yellow pepper with a little bit of olive oil, and bake in a 225 C / 450 F oven for about 45 min, until blistered and brown on all sides. Let cool for 10 minutes. Peel and seed the pepper. Weigh 100 g of pepper flesh, cut into small dice, and reserve. In a pan over medium heat, sauté the apple and plum dice in the olive oil. Season with salt, and cook until golden brown. Add the eggplant, yellow pepper, saffron, paprika, and lemon peel. Cover and simmer over low heat for 45 minutes. Remove from the heat. Mix in the lemon juice, let cool, and reserve. Brush the fish with some of the olive oil, and season with salt and pepper. In a bowl, toss the cherry tomatoes in the remaining olive oil, seasoned with salt and pepper. Prepare a grill (wood, charcoal or gas) for medium heat. Place the tomatoes on a piece of aluminum foil, and cook on the grill until soft. 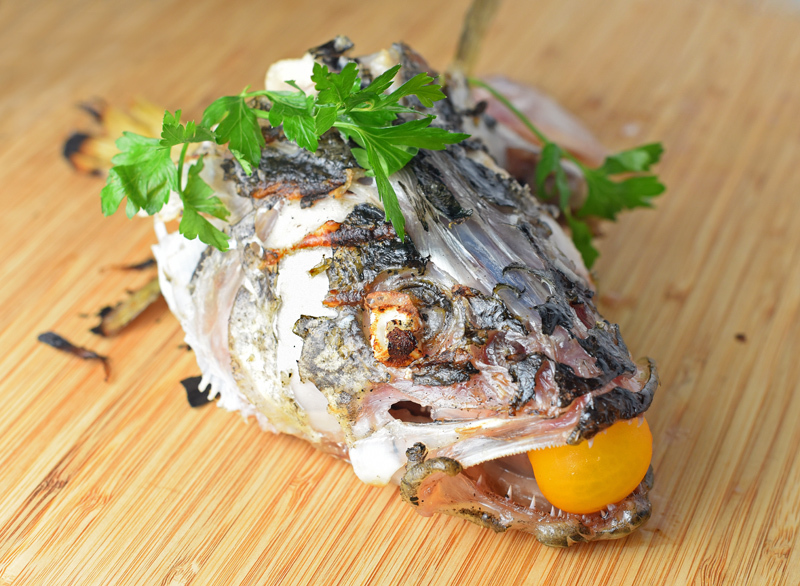 Cook the fish on the grill, flipping it carefully only once to avoid breakage. 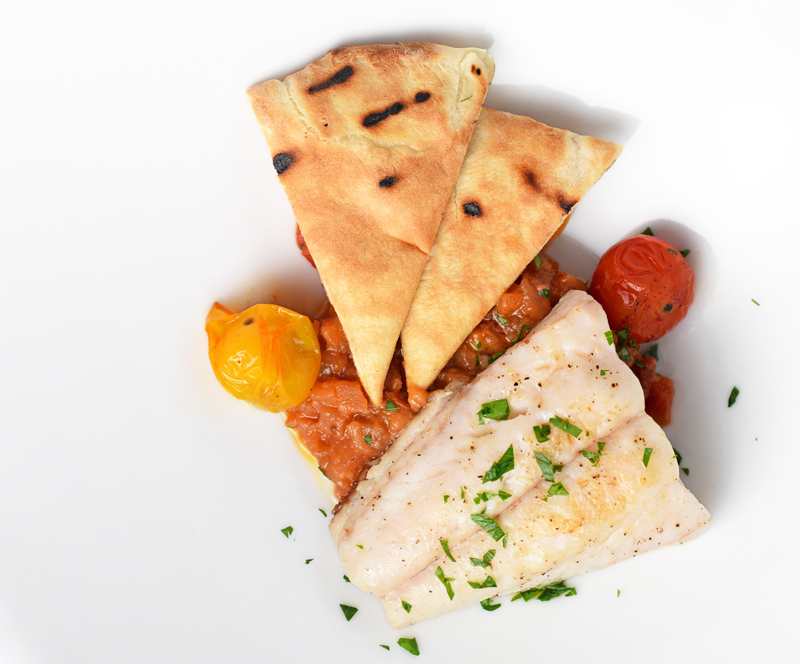 Cut the lepinja or pita into quarters, brush with the oil from the cherry tomato bowl, and grill until warm. 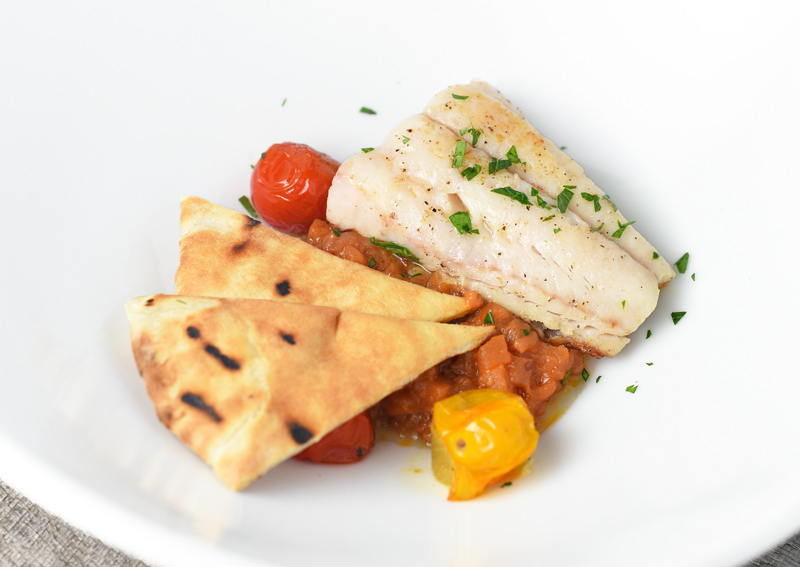 Sprinkle the pike with parsley, and serve with the cherry tomatoes, lepinja quarters, and ajvar. The weather was bitterly cold that March morning, and whiteout conditions were looming. 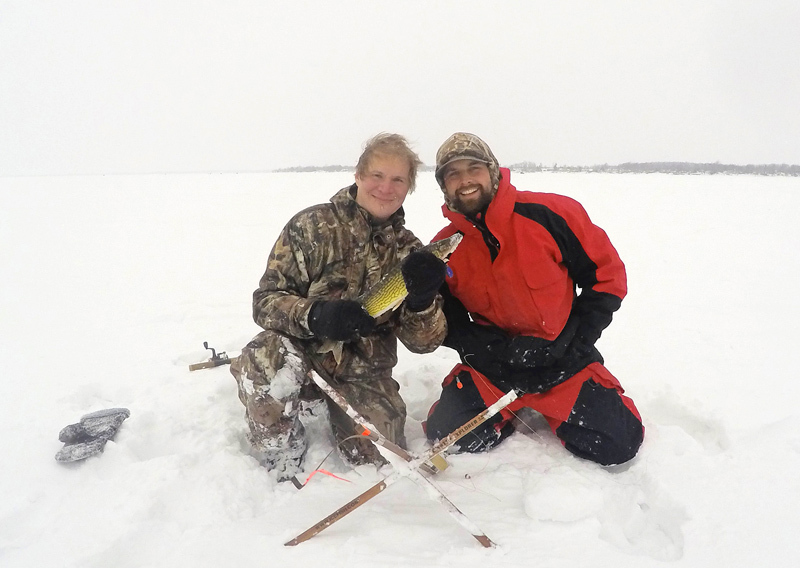 Only a handful of indomitable fishermen (us, obviously) had braved the elements and ventured out on the frozen lake, drilling holes through several feet of ice covered by about as much snow. The fishing was hard, but we persevered, and our efforts did not go unrewarded. Finally, the flag on one of our tip-ups went up. We rushed to that hole in the ice, running painfully through the snow cover, and started fighting to bring to the surface the beast that had gobbled up our bait. 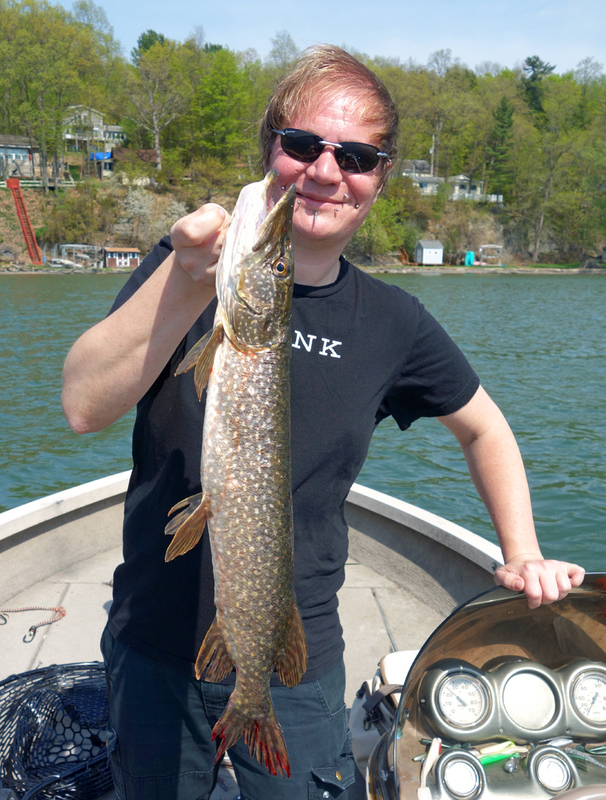 Several minutes later, our hands frozen by the cold and burnt by the friction of the line against our raw skin, we pulled out a magnificent pike, at least two-feet long. It was a female, and with spawning season just around the corner, it was full of eggs. As we cut open its belly, toasted bagel in one hand and champagne flute in the other, the roe, a beautiful shade of golden yellow, sparkled on the pristine ice of majestic Lake Ontario. Yeah… no, that didn’t really happen. Now that spring is here, I can look back at my ice fishing season and tell you it was once again filled with tough times — so much so that I should probably write an article about it. On a recent outing with Captain Bill and his gang, after 8 hours spent on Lake Ontario with a sonar and a good two dozen lines in the water, all we had to show for ourselves was a handful of yellow perch and one pickerel (and wait until I tell you about my other trips). On the long way back, stuck in Cortland, NY in the middle of a snowstorm, then home, while filleting those tiny perch, I managed to find the inspiration to make this burger recipe, and to dream of the better story I could have recounted to my readership, had the fish spent their winter retreat in the places where we expected them to be. Putting on my Vladimir Poutine hat, I, too, started embellishing the facts a little, and imagining fish of epic size. That being said, yellow perch, pickerel, and pike are close relatives. They’re all species we fish for in our Lake Ontario outings, all spawn around the same time in spring, and they don’t taste all that different. So it’s safe to say that you can use them more or less interchangeably in the kitchen, pairing the meat from one species with the roe from another if needed. And to satisfy my delusions of grandeur, I’ve decided today’s recipe will be made with “pike”, regardless of what I actually brought home. One big difference is the cleaning time, of course. The perch will require patience and practice, and you’ll still only end up with tiny fillets full of bones. At the same time, it can provide a substantial amount of roe, and as I explained recently, it would be a shame to let that go to waste. 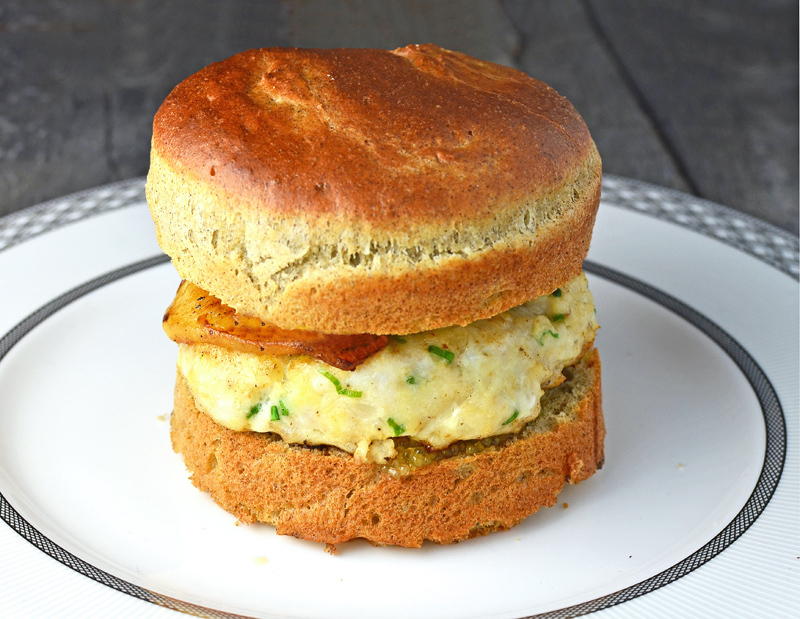 Hence the burger idea, where the ground perch doesn’t need to be thoroughly boned, and the eggs, spread onto the bun, reinforce the subtle taste of the freshwater fish. I know, I know: there are too many burger recipes on this blog. But they serve a purpose! If you spent your winter vegging in front of the TV instead of going ice fishing, all is not lost. 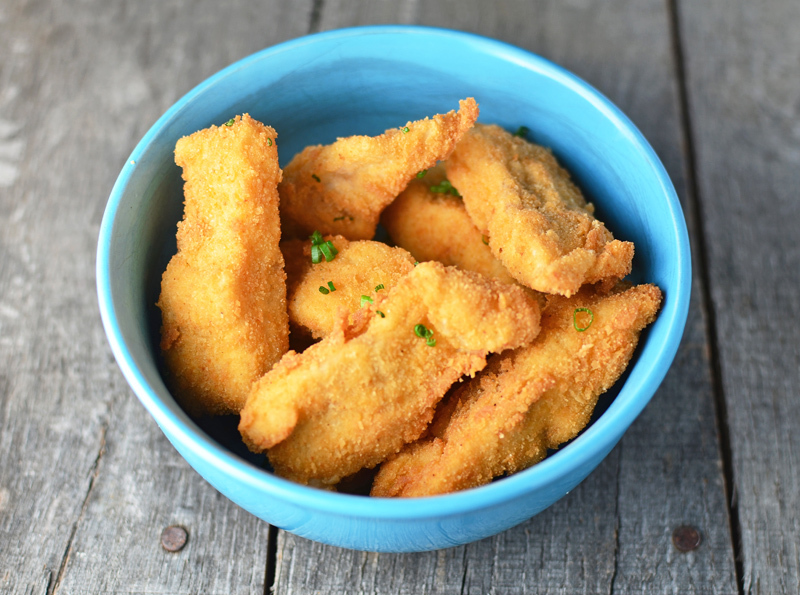 First, you can use a fish like flounder, which is readily available in stores. Or rainbow trout. Or catfish. Be creative, for Vlad’s sake! 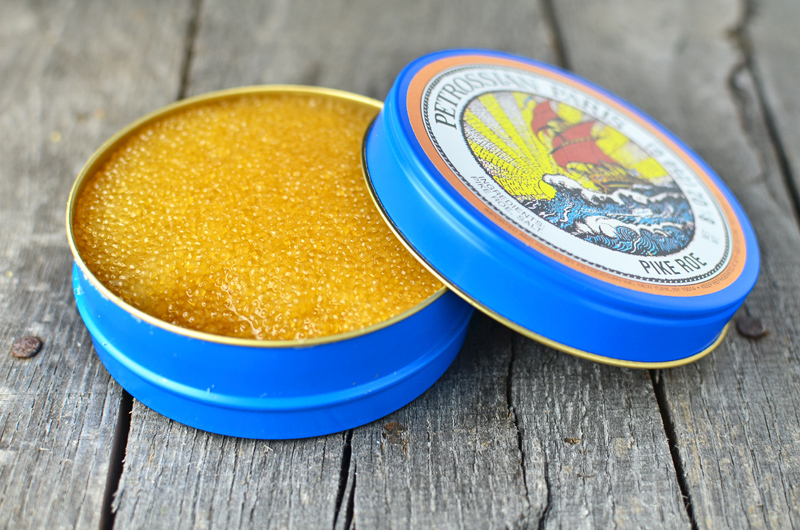 Second, you can buy pike roe, although at a sizable cost, whether you go the Petrossian route or find slightly cheaper alternatives. The rest of the ingredients are much easier to obtain. You might remember the potato bun recipe I posted a couple years ago. Here’s another bun, made with buckwheat flour this time. 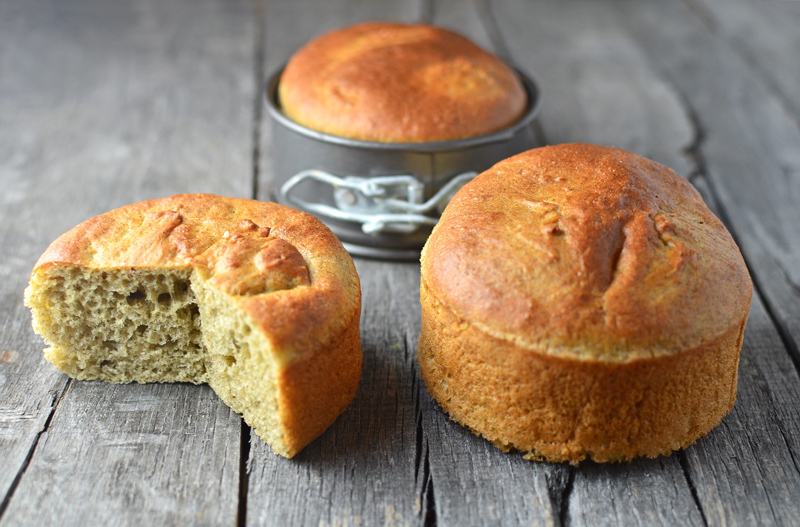 The buckwheat flavor can easily overpower everything else, so it’s important to tone it down with some plain white flour. 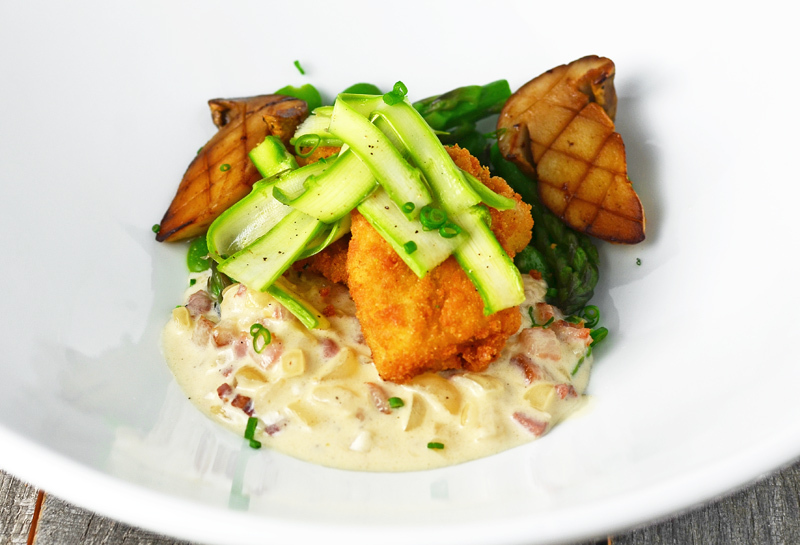 The green apple brings both sweetness and sourness, and pairs beautifully with the fish, buckwheat, and celery root. The latter appears in a gratin that I serve on the side and which is loosely adapted from Barbara Kafka’s Vegetable Love. Mix the yeast, milk, and sugar, and let rest for 5 minutes. In the bowl of an electric mixer fit with the paddle attachment, add the yeast mixture, egg yolks, buckwheat flour, and half of the bread flour, and mix on medium speed until homogenous. Add the rest of the flour, then the salt and butter, and mix for another 4 minutes, scraping the paddle and bowl every once in a while. Grease four 5 cm tall, 10 cm diameter ring molds with a generous amount of butter, and place them on a baking sheet lined with greased parchment paper. It’s important to make sure that the molds are completely covered with butter inside, otherwise the dough will likely stick to the molds. Divide the dough evenly between the ring molds, and flatten each portion into a disc that covers the bottom of the mold completely. Cover the molds with plastic wrap, and let rise in a warm place for about 1 1/2 hours, until the dough has risen to just about 4 cm (the buns will rise some more when you bake them). Place a dish filled with water at the bottom of a 225 C / 425 F oven. Remove the plastic wrap from the ring molds, and bake in the oven for about 15 minutes, until the tops of the buns are a rich brown color. Transfer the buns to a cooling rack, and let cool for at least 30 minutes. Unmold and use immediately, or store in plastic wrap for up to 2 days. In a small saucepan over medium heat, sauté the apple and onion in the butter until soft. Remove from heat, and let cool. Cut the the fish fillets into small chunks, and toss in a bowl with the apple, onion, salt, and black pepper. Pass the fish mixture through the fine die of a meat grinder, and return to the bowl. Mix in the breadcrumbs, egg, and chives. Shape into four 10 cm diameter patties, cover, and refrigerate. Cook the celery root in boiling water for 7 minutes, proceeding in batches if necessary. Reserve. In a saucepan over high heat, reduce the chicken stock by half. Add the heavy cream, then reduce the mixture to 140 g. Reserve. In a 11 cm x 22 cm x 7 cm stoneware dish , arrange a couple of layers of celery root slices. Cover with some of the reduced cream mixture, and season with salt and pepper. Repeat until you run out of celery root and cream. Mix the gruyère and breadcrumbs in a bowl, then sprinkle on top of the gratin. Bake in a 200 C / 400 F oven for about 40 minutes, until the top forms a light brown crust. Brown the butter in a saucepan over medium heat. Add the apples, sauté for a couple minutes, then cover with a lid, and cook over low heat until soft. Transfer about half of the apples to a blender, add the milk, and blend until smooth. Reserve the cooked apple slices and the apple purée separately. 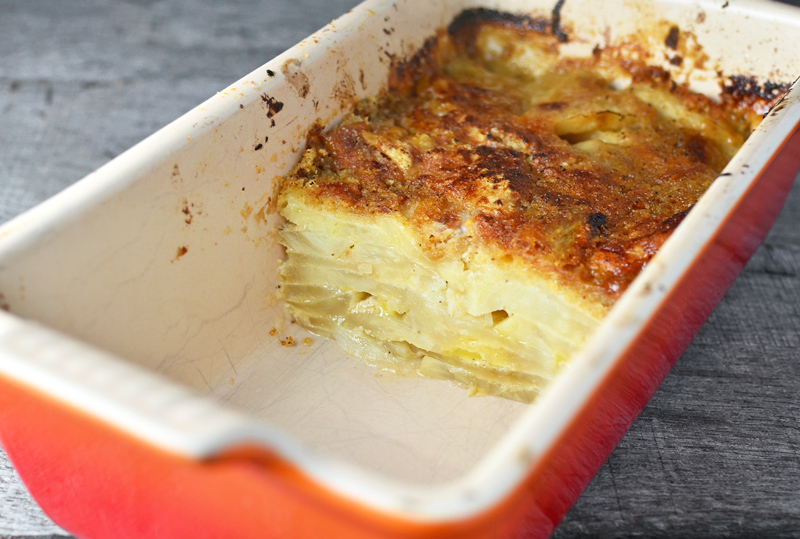 Reheat the celery root gratin in the oven if needed. Slice the buckwheat buns crosswise, and toast in a 175 C / 350 F oven until crispy. Heat the butter and olive oil in a pan over medium heat. Sauté the patties until golden brown on both sides, then transfer to an oven-proof dish, and bake in a 175 C / 350 F oven until the internal temperature reaches 55 C / 131 F.
Reheat the green apple slices and purée (microwave is fine). Spread some pike roe on the bottom half of each bun, and top with a fish patty. Spread the apple purée and arrange some apple slices on the top bun halves. Close the burgers if desired, and serve immediately with the celery root gratin. You may not be a man like Putin, but you can try to eat like him. Here are some excerpts from the news on his presidential feasts in the Kremlin and in other parts of the Empire. The Kremlin insists it was a fair catch, and the fish was turned into pike steaks for Mr President and his Prime Minister. 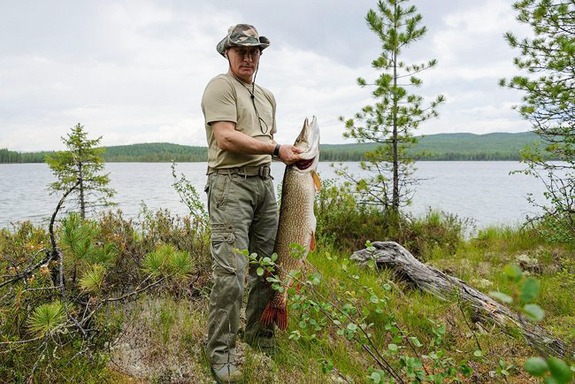 As for those who question the actual weight of the fish, we can do quick check: Putin is 5’7″ (= 67″) tall, the fish is no more than about 2/3 of his height (= 45″), and depending on which northern pike length-to-weight chart or formula you choose, a fish of that size weighs 22 lb to 29 lb. Conclusion: the official weight of 46 lb seems a bit exaggerated! So what does Vladimir Putin eat these days? An article here tells us a bit more about what was on the menu during the Siberian trip. Upon his arrival in Chita, the President chose a quick snack of vegetables, boiled tongue, and potato pancakes before a late meeting. Not just any potato pancakes though, but pancakes with Baikal omul and omul caviar, a specialty of local restaurant Zabaikalye. During a more formal dinner at the same eatery, he was served a “Cossack circle” of game (check out the pictures of gargantuan round platters on the web site), consisting of stuffed quail, wild goat tongues, venison and boar sausages, “and much more”. This sounds like heaven to me, but we’re told that the restaurant’s honorable guest preferred a buryat dish called buuza (a steamed dumpling filled with meat that’s not very different from Central Asian Manty), and even ordered seconds. For dessert, a strudel of cowberries, sea buckthorns and black currants was much appreciated. Take 1 salmon filet, skin-on and 1 cm-thick (trim off the flesh accordingly), and place on a piece of plastic wrap. Cover with a sheet of nori, and spread some pike-peach mousse 1 cm-thick. Take another sheet of nori, spread some salmon mousse 1 cm-thick, and roll. Place the salmon mousse roll on top of the salmon filet preparation, and roll again. At Sochi’s sanatorium for the presidential administration — according to waitress Irina — Putin likes to have a borscht or some fish and onion rasstegai (open-faced pirozhki) served with a light fish soup. Apparently, the President’s penchant for seafood has an immediate impact on the local food trends. We learn that during a summit of the Eurasian Economic Community, a dish was served consisting of a whole monkfish stuffed with seafood and injected (yes, with a syringe) with fruit juice — don’t ask me how the juice stayed in there. 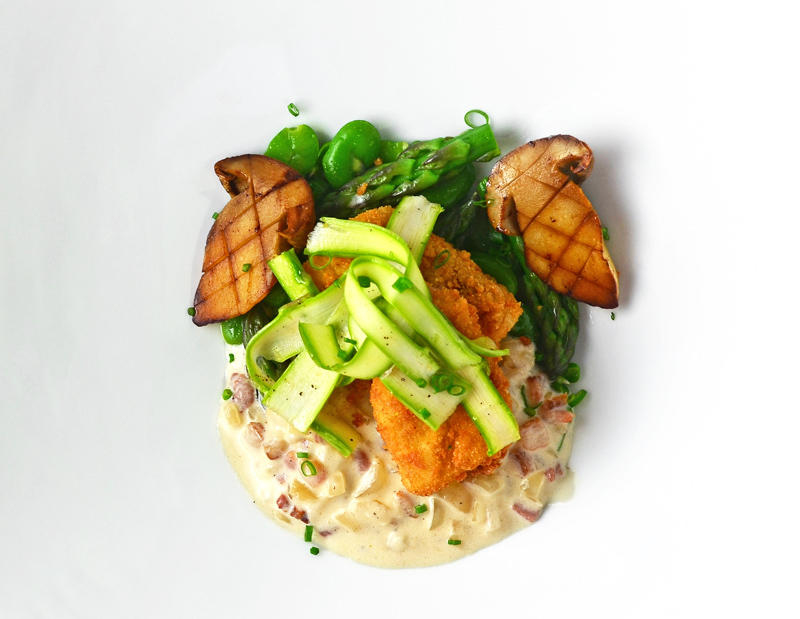 Another dish popularized by VVP is a fish terrine made of ground salmon, pike-perch, scallop, and monkfish, with a carrot brunoise. Time will tell if the Vlad’s recent bachelorhood will bring more reports of lavish dinners. In the meantime, here’s an updated summary of his exploits.